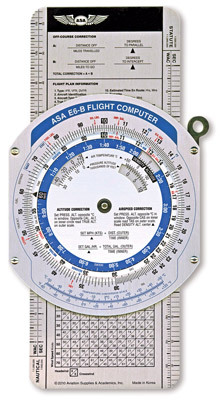 The best slide-rule-style flight computer on the market, now enhanced with color for even easier readability. On the circular side, black is used for the rate arrow and units to be calculated; Red is used for weight and volume; Blue is used for distance, time and temperature scales. On the wind side, colors are used to identify wind variation: blue identifies west (or right wind correction angle) and red identifies east (or left wind correction angle). ASA’s color E6-B is made with solid aluminum construction and features all the functionality pilots have relied on for decades. A venerable favorite, now even better! Vinyl case and instruction booklet included. Measures 9-3/4" x 5". Review: It took me awhile to catch on to its use. But after figuring out how to work it, I came up with the same answers as my computerized E6-B. So, be sure to take one when you're going cross country, in case your computer batteries run out. Review: I am just a student, and it's easy enough for me. It has the formulas needed in clear, easy to read and bright colors. Review: This E6-B is very solidly made and operates very smoothly. It is very clearly marked and easy to read. Review: Works great can't find issues with it. Review: Don't waist your money on different E6-B. Very good material. I love it very accurate (the paper on move sideway ).